The town of Blokzijl was at the Zuiderzee and had access to the North-sea until the reclamation of the Noordoostpolder. Blokzijl was a commercial town with a rich history and in the good years had about 160 ships. To reach the Zuiderzee there was a channel and a long dam. The major problem with this channel was the silting . There was much fine sand deposited along the former coast. The finest sand in the world is Blokzijl sand. The larger ships could not entering Blokzijl and their cargo need to be transferred into smaller ships. 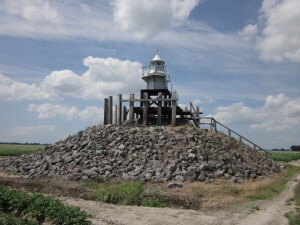 In order to point skippers the correct route to the harbor and too warn the skippers that they have reached the end of the dam a beacon was placed. The dam was 1800 meters long with the lighthouse at the end, of which the latest lighthouse was build around 1906. The original plans are still unknown. The lighthouse was seven meters ( 21 feet) high, the first lamp was a petrol (oil) lamp. Due to the use of patrol (oil) the glass needed to be cleaned frequently. The lighthouse watchman had to ensure that every evening the light was lit and in the morning extinguished. Around 1936 the upper part has been removed from the lighthouse, and a different lamp placed. The petrol lamp was replaced by a gas lamp, the gas used was blauwgas, it smelled terrible. The last lighthouse watcher was Kees Klinkert, he was born in 1914, and he remembered much about the lighthouse so he could tell and explained a lot about her. In March 2007, the “The Lighthouse foundation” had an interview with him. He was asked to reopen the the replica lighthouse in 2008. 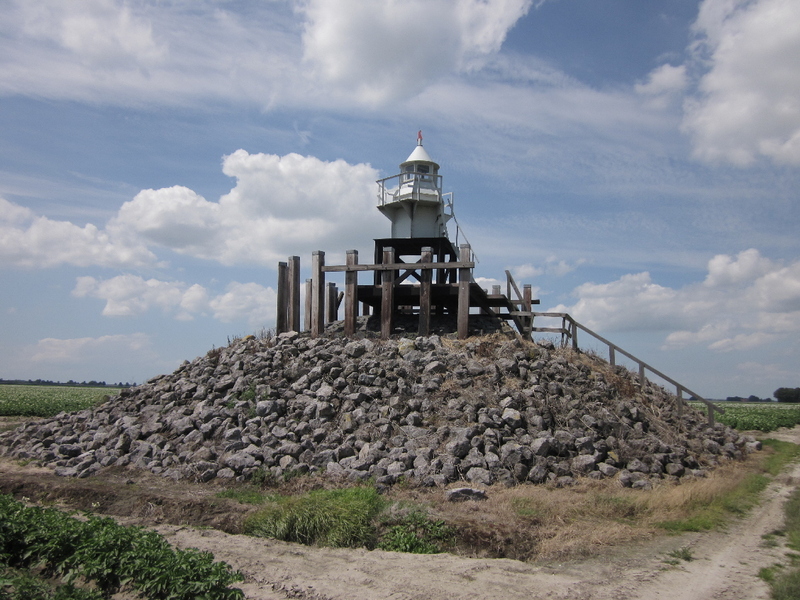 Due to the land reclaim of the Noord Oostpolder the lighthouse became useless, 1942. the dam has been excavated and the lighthouse blown up. The basalt blocks were used for other dikes, the rubble of the dam was used as substrate for Steenwijkerweg.